- Photographer/Videographer: Film or photograph Rural Action events. You’ll build your portfolio while contributing to the community! - Photo Archivist: Activities for the photo archivist include the cataloging of images and archival material by organizing and placing the image into a photo database. 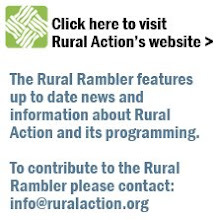 For more information, send an email to sara@ruralaction.org. Rural Action’s ELP is looking for volunteers to help with their exciting projects- dates vary. They need face painters, puppeteers and general adult helpers for their children’s events. To get involved please contact Diane Wiktorowski at dianew75@hotmail.com.